We really cannot expect our pet dogs to brush their teeth by themselves. However, there are a lot of tools or devices that we can give to them to help them on their way to healthier teeth. One of the most helpful objects in terms of ensuring optimum canine dental health is a doggie dental chew. These come in various types, shapes, and even flavors; picking the right one can be quite challenging particularly for absolute newbies. Not to fret, though as we’ve prepared a listing of the 5 best dental chews for dogs as well as a comprehensive buyer’s guide to help you in your pursuit. One of the best things about the Greenies Original TEENIE Dog Dental Chews is that it provides an exceptional blend of macronutrients and micronutrients to help enhance its dental health-giving benefits. Its chewy formulation is flavored in delicious poultry goodness so your pet dog will be more than enticed to chew on it. Each doggie treat is packed with bone and teeth-building and strengthening calcium and phosphorus while it has also managed to add choline and lecithin into the mixture for additional health benefits. The chewy texture of the Greenies TEENIE serves like a brush on your pooch’s teeth and a sponge on the gums so that food particles are effectively removed and the formation of plaque and tartar is prevented. The formulation is made of only select ingredients; although it does contain wheat gluten. So, if you’re not really keen on giving your hound something that it is allergic to, then you can skip this dental chew. However, considering that wheat gluten is as allergenic as any other protein rich food like beef and chicken, the amino acids it provides should make you want to give it to your pet. 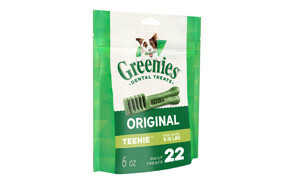 Like many dog dental treats, the Greenies TEENIE is also excellent in giving your pet fresher breath. In our list of doggie dental treats, Virbac’s C.E.T. Enzymatic Oral Hygiene Chews happens to contain the highest protein levels at a minimum of 75%. This is important since we would like to give our pooches only the best. Protein is an important macronutrient that dogs need for the optimum development of its tissues, including those found in the oral cavity. However, caution should be observed in giving the Virbac dental chews for dogs on canines that are diagnosed with kidney disease or those with significantly reduced renal function. Too much protein can exacerbate the kidney problem. Nevertheless, the addition of glucose oxidase into its formulation can extend the health-giving benefits of its doggie chew formulation for optimum digestive health. This significantly improves your pet’s ability to fight infections that may originate from the oral cavity. It doesn’t come enriched with vitamins and minerals, however. But its high protein and probiotic contents alone are sufficient to make this as one of the healthy dog treats you can ever buy. Energy-dense. That is the most appropriate description for these dog chews from Pedigree. The Dentastix has been around for many years and it has the trust of countless dog owners as well as veterinarians the world over. 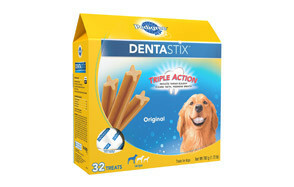 What makes the Dentastix so popular is that each stick is packed with 53 kcalories, making it ideal for snacking after playing and /or exercise. The unique design of the doggie chew also helps remove stubborn food particles that may have been stuck in the gum line or in between teeth. The other great thing about Dentastix dog dental treats is that it comes infused with turmeric and green tea extract which are both acclaimed for their anti-inflammatory and antioxidant properties, respectively. It also comes with a good mix of B vitamins and the vitamins E and D. However, currently, there is controversy regarding its high calorie formulation. Its minimum protein and fat content is rated at 8% and 1% respectively, yet it has a much higher calorie profile than the other products in this list. Nevertheless, Dentastix is an excellent option for highly active hounds that will require not only excellent dental health but also added energy to perform their activities. Boasting of a seal of acceptance conferred by the Veterinary Oral Health Council, Milk-Bone’s Advanced Oral Care Brushing Chews Daily Dental Dog Treats prides itself of a very unique design in each of the dog treats. The treats are shaped like the classic doggie bone yet come with ridges and nubs that act like enlarged bristles of a human toothbrush. This unique design makes the Milk-Bone dental chews for canines truly exceptional when it comes to the mechanical removal of food particles and other debris off of your canine friend’s dentition. It tastes surprisingly delicious, too, so dogs won’t have any issues chowing on it. Milk-Bone also contains good mix of proteins and fats, although its moisture content is one of the highest in this list. Not that it’s inherently bad as this is especially beneficial for doggies that rarely drink. However, it only means that the remaining 82% is what actually constitutes the nutrient value of Milk-Bone. Nevertheless, it’s not really a nutritional supplement so we’re thankful enough that the company infused quite a lot of micronutrients into these dog dental treats. The problem with most dental treats for dogs is that they get chowed down very easily. They don’t really last long such that an entire stick can be finished in just a single sitting. Now, if you’re only after the mechanical removal of dental debris so that you can effectively prevent the development or occurrence of plaque and tartar on your pet’s dentition, then Pawstruck’s Natural Cow Hooves for Dogs preparation should come in very handy. Just look at Pawstruck as a very resilient yet equally effective way of cleaning your pooch’s dentition that should last a really long time. Some of you may have already given your dog rawhide. Cow hooves are excellent alternatives especially these dental chews for dogs from Pawstruck as these are sourced from cattle that are grass-fed and free-ranged. Additionally, their facilities are visited, evaluated, and certified by government agencies like the FDA and the USDA to ensure quality in all of their products. Each batch of carefully harvested cow hooves is meticulously cleaned and then roasted to perfection to help lock in all the flavors of beef. It really is a very unique way to take care of your hound’s teeth. Buying dog dental chews is not really that difficult as there are only a few things that you simply have to look for to narrow down your choices. While these may not be absolute, they can nevertheless serve as guidelines for you to consider when picking the right dental treats or chews for your hound. If you’re planning to give a few dog dental chews to your pup, rawhide or even cow hooves may not really be the best product for them. Their chew force will be quite insignificant relative to the toughness of the doggie dental chew. A more appropriate item will be something that is chewy. It should also not be ultra-soft, otherwise, there won’t be enough mechanical action to remove particles on the dentition. Likewise, if you have an adult dog that happens to be a very powerful chewer, giving it soft dental chews will be a very expensive proposition as they can easily chow down on these treats in minutes. What you will need are treats that are more resilient, tougher against the chewing strength of your pooch. Dental chews for dogs come in various types. Some are formulated more like a nutritious treat while others go for the more natural without any added ingredients. In case you want something nutritious for your pet, you might have to really look at the ingredients, one by one. In our list of the best dental chews for dogs, we listed 4 products that came with nutritional value. Now, it’s not enough that you only look at the different nutrients listed in the label, you will also have to check if this is appropriate for your pet. For example, we did mention that dogs thrive on high protein diet particularly for building and maintaining body tissues. However, too much protein is also not good for pets that have kidney problems since these macromolecules are very large and the kidneys will have to work double-time to filter them from the blood so that they don’t get flushed out into the urine. This puts additional strain on the kidneys which, if it is already in a compromised state, can worsen its condition. As a rule, you need to pick products that contain only natural ingredients. It is okay to get some synthetic ingredients as long as these are considered safe and do not constitute major ingredients of the product. In other words, you will need to do your homework regarding these ingredients. There are now plenty of recreational raw bones intended primarily for cleaning your canine’s teeth and oral cavity. These are often sourced from organic and antibiotic-free animals. We had to emphasize “often” because there are those manufacturers that manufacture recreational raw bone employing unscrupulous practices. So you might be wary of these. That is why, as much as possible always supervise your dog every time it is chewing on something, especially raw bone. These can get easily chipped and the fragments can be swallowed by your pet. This can injure the lining of its digestive tract or can also get lodged in the gut. Just like raw bone, there are manufacturers that offer natural chews like bully sticks, rawhide, cow hooves, pork ears, deer antlers, and the like. These are very excellent dog dental chews as they are hardy enough to withstand the chewing force of your pet. However, you really have to be wise when you do buy these types of chews as these are sourced from animals. As such, make sure that the animals these products are obtained from were grown and processed using natural and organic methods. There should be no antibiotics, bleaching, additives, hormones, or any other harsh substance used in its manufacture. Do My Pets Really Need Dog Dental Chews? Now that we’ve taken care of the business of how you can choose the right dental chew for your beloved dog, it’s time to address one of the nagging questions that newbie dog owners have. Do your pets really need dog dental chews? Well, let’s put it this way. Dogs spend most of the day licking, biting, nipping, and chewing on objects and surfaces that we simply do not know if there are microorganisms like bacteria, virus, or fungi present. The food that we give them, especially dry kibbles, are also filled with starch that bacteria and fungi really adore. It is this combination of environmental debris and leftover food particles that give canines a rather “unhealthy” oral cavity. Normally, these microorganisms in our pet’s mouth do not cause disease; not yet anyway. That is because it takes an awful lot of time for them to establish a foothold on the surface of your pet’s teeth. If food debris and other starchy particles are present on the teeth or in the gum line, this is an excellent chance for these germs to hide and start multiplying by feeding on the carbohydrates contained in these food debris particles. Over time, they will be releasing a very thin, very clear, yet very tough protective layer of film that we call plaque. This helps protect germs from mechanical forces. Give it a few more weeks and this thin layer of the protective film begins to harden into something like cement. This is now what we call tartar. Underneath both plaque and tartar, the germs continuously secrete highly acidic substances that erode the surface of the teeth, creating tooth decay. If it reaches the gum line, this leads to irritation, producing gingivitis. If this is allowed to continue, both the teeth and the gums become affected leading to what everyone now knows as periodontal disease. Again, if this is allowed to deteriorate, the bacteria can gain access to the blood vessels and be carried by the blood to be lodged into other organs inside the dog’s body. This is the start of more serious health problems like heart valve disease in dogs as well as massive infection of the blood. And to think that it all started with a few food debris and other particles that your dog failed to remove. You really cannot blame your dog, though. It doesn’t know how to brush its teeth. It also doesn’t know how to use the dental floss or even the mouthwash. The only thing it knows is to chew. That is why you need to give your canine friend only the best possible dental chew possible to help physically remove the debris and particles that can become the starting point to the development of plaque and tartar. Unless you’re going to brush your dog’s teeth on a daily basis, you’re better off giving them a dental treat. What are the Benefits of Dental Chews for Dogs? You now understand why it is often necessary to give your dog dental chews every now and then. Let us try to summarize what we have been discussing so far in terms of the benefits that these dental chews provide to your pet. Dental chews for dogs clean the teeth and remove debris from the gums. This prevents bacteria from taking up residence in these areas so they will not create plaque and tartar. At the same time, germs will not secrete acids that will corrode the surface of the teeth, maintaining its integrity and strength while also firming up the gums. Technically, what it does is that it greatly improves canine dental health. Aside from the acids that bacteria secrete, they also give off byproducts of their metabolism. This mixes with your pet’s saliva producing a characteristic foul odor. You really don’t want your pooch sticking its face right in front of you and licking you incessantly if its breath stinks like the sewer. Preventing bacteria from colonizing the teeth can help reduce bad breath in dogs. This is a natural end-result of improved teeth and gum health. Because the integrity of the teeth and gums is preserved, you eliminate the risk of periodontal disease in your pet. Additionally, this also helps minimize the risk of developing oral health-associated systemic infections. What are the Different Types of Dental Chews for Dogs? As you may have observed in our discussion, there are various types of dental chews for dogs that you can buy to help improve the dental health of your pet. Here are some of the more common. Dental diets – These are dry kibble-like chews that provide nutrition while also helping your pet to clean its teeth, freshen its breath, and remove plaque. These are often larger than dry kibbles and are specially designed to have ridges or nubs for the mechanical removal of food particles. Dental treats – There are certain products that look like an ordinary doggie chew but are specially blended with a variety of substances or even medications to help improve canine oral health. For example, there are dental treats that are infused with 10% of chlorhexidine gluconate which helps kill bacteria within the oral cavity. Rawhide chews and bully sticks – We already mentioned this above. These are excellent dog dental chews as they are more resilient to the chewing force of dogs. Depending on the product, these are also very rich in proteins as they are sourced from animals. That being said, you’d have to be careful in your choice as there is a tendency that you might end up with a mediocre product. Chew toys – Some doggie toys are designed with ridges or nubs to help remove debris from the dog’s mouth. Canines are naturally playful and they love to bite and pull onto things. KONG doggie toys come with refillable compartments which you can fill with delicious treats. The rubber material is considered safe and very resistant to chewing so your pooch gets to clean its teeth while enjoying some delicious treats. Managing your pet’s oral and dental health is a necessity for preventing tooth decay, bad breath, and periodontal disease in dogs. 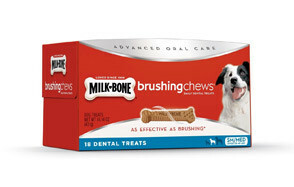 Since they cannot brush their teeth, it’s a great idea to give your dog dental chews. In saying that, there is a wide variety of dental chews for dogs to help you narrow down your options.